Groovy container or rock garden perennial that is basically a silver bun of softness. Even water beads up on the hairy metallic fine leaves. 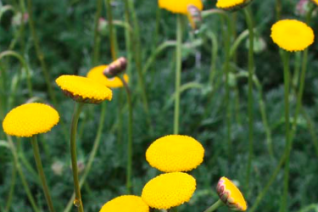 4″ stems rise to bear petal-less golden yellow disks. whimsical and wonderful and blooms repeatedly all summer in full sun and exceptionally well drained soil with consistent moisture. Let it dry between watering and give this little evergreen plant good air circulation. Very light watering. 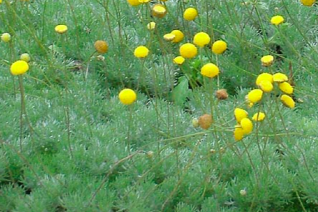 Actually, this adorable plants best application may be in modern seasonal containers. Improves hardiness too. Silver buns and dancing disks, damn. To 6″ wide.